Reel type lawn mowers have been around for a long, long time. The first commercially produced reel mowers date back to about 1830. These were large, cumbersome mowers that needed to pulled by a horse to move. Later in the 19th century, the mowers were put into motion with the use of steam engines and tractors. As technology developed smaller engines, the reel type lawn mower became self contained and self propelled. Lawns became more popular in suburban areas of the country, and well trimmed grass was the norm. For decades the power reel mower was found in nearly every garage. If the lawn was smaller, push reel mowers were used. The dominance of the reel mower began to be challenged in the 1970’s, when rotary ( single blade mowers) appeared. This design allowed easy adjustment of the cutting deck, so the could be of almost any height after mowing ( reel mowers were famous for their short “close shave” lawn appearance). Mulching also became an option. Unlike reel mowers, rotary mowers tend to break off the blades of grass, instead of neatly cutting each blade like a pair if scissors, as a reel mower does. Also, the appearance of a lawn cut with a reel mower appears much more professional to the discriminating eye when compared to a rotary mower. For these reasons, the reel mower has never completely disappeared. They are still used in areas where lawn appearance is paramount ( like golf courses and city parks). If a short, even cut of the grass is needed ( like a putting green) there is just no substitute for a reel mower. The simple design of a reel type lawn mower has not changed much over the past 100 years. The secret of a well trimmed lawn is in the action of the cutting blades on the reel itself. These blades pass over a stationary ‘bed knife’ blade. The grass trapped between the action of the reel blades (which are constantly spinning) and the stationary bed knife blade (which remains stationary) is neatly cut. This action has been compared to a pair of scissors cutting your lawn. Most people would agree the action of the mower is a little faster than trimming the lawn by hand with a pair of scissors. The Bed Knife. At the very heart of all reel mowers is the bed knife. This is a large, sturdy piece of steel with a machine ground top edge. The bed knife takes up almost the entire distance between the wheels on each end, and determines the cutting width of the mower. As the movable blades on the reel pass by the bed knife, the grass trapped between the blades and the bed knife is sheared off. The slight space between the bed knife and the reel is adjusted by a precision screw mechanism. The Reel. Reel type lawn mowers have several blades on the reel, usually varying between four to seven blades. Generally, the more expensive a mower becomes, the more blades will be present. It is the moving blades on the reel mower that are doing most of the work. The reel itself is best described as a cylinder. Although the blades are fastened to the central hub in a spiral fashion, the height of the blades remains constant over their entire length. Most would not consider a reel type lawn mower a precision piece equipment, but the close tolerances required between the blades on the reel and the bed knife they come in contact with is true poetry in motion. If even a small portion of the reel is too high ( or low) the grass will not be cut properly. Very tall grass or high weeds are not cut well by reel mowers. Strands or clumps of grass can be left behind, requiring several passes over the same area. 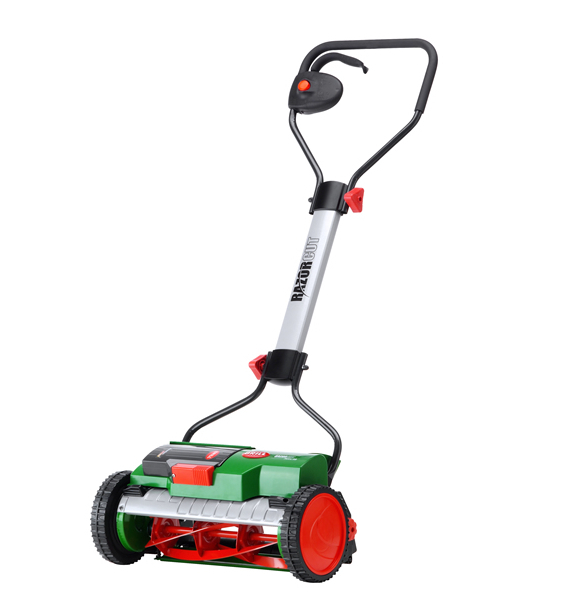 Most reel mowers are designed to have little, if any contact between the blades and the bed knife. This reduces he noise of the mower, and requires less power to make the reel turn. This can be especially important with push reel mowers. In the old days, sharpening the reel involved expensive machinery to evenly grind the blades along the entire length ( professional reel type mowers continue to use this method). This is a very time consuming process, which contributes to the high cost of sharpening. More often, a process is used known as ‘lapping’. This involves rotating the reel backwards, tightening the bed knife against the reel blades, and applying an abrasive compound to the blades as they turn. The cutting edge is honed sharp, and the height of the blades becomes uniform. Once the lapping is complete, the abrasive mixture is washed off, and the bed knife is adjusted to have the proper gap for cutting grass. The Wheels.. There is more to the wheels on a reel mower than meets the eye. 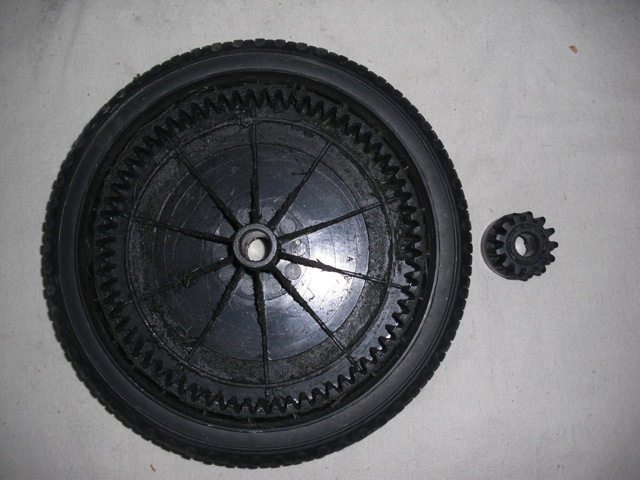 All reel mowers have a hidden gear on the inside circumference of the wheel. 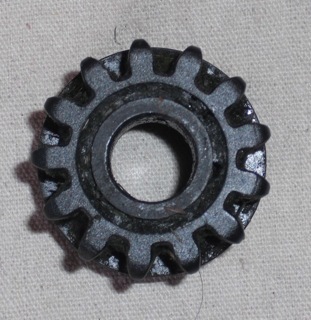 This gear engages a much smaller gear which is attached to the reel shaft. In the case of a push reel mower, the reel is engaged as the mower is pushed forwards. The gear disengages when the mower is pulled backwards or the pushing stops. This allows the reel to continue to ‘coast’ and spin, and provides the soft, nostalgic sound push reel mowers have been making for decades. Power reel powers have a chain that connects the reel to the engine or motor. The spinning reel engages the wheels, which move the mower forwards. Power reel mowers typically have little adjustment for speed due to this design, since the gear ration between the two parts (engine and reel) remains constant. The Roller.. The roller is located behind the bed knife and the reel. It is the roller that is in constant contact with the freshly mowed lawn. The roller also controls the height of the bed knife. This in turn controls the height of the cut. The lower the roller is set, the higher the lawn is cut. In the old days, the roller had little adjustment, and all lawns were cut either short, or very short. Newer models have both thicker rollers, and much broader adjustments, allowing for higher lawns. The Grass Catcher.. Reel mowers provide a gentle shower of manicured clippings out the back. Since the grass is cut once at the base ( unlike rotary mowers which can cut a blade of grass several times before the grass is discharged from the deck), mulching is not an option. A grass catcher simply provides a place for the cut grass to fall. Once full, mowing is stopped, and the bag is emptied. Power reel type lawn mowers were the American standard for decades. Providing the best features of reel mowers with the convenience of being self propelled, these mowers were loved by millions. The horsepower needed to drive the wheels and the cutting blades is significantly less than a rotary mower. The early versions of this mower may have had an engine as small as 3 HP. Compare this to a modern rotary mower which may come equipped with a 5, 6, or 8 HP engine. Power reel mowers are still available from a few manufacturers. Sales are small in comparison to other types of mowers, but a niche market still exists, especially with golf courses that need to trim putting greens. Take me to the Power Reel Mowers review page to explore the major brands and features. Let’s suppose you want your lawn to have the manicured look only a reel mower can provide. Maybe your lawn in especially dense, and using a push reel mower may take a little more effort than you can muster. 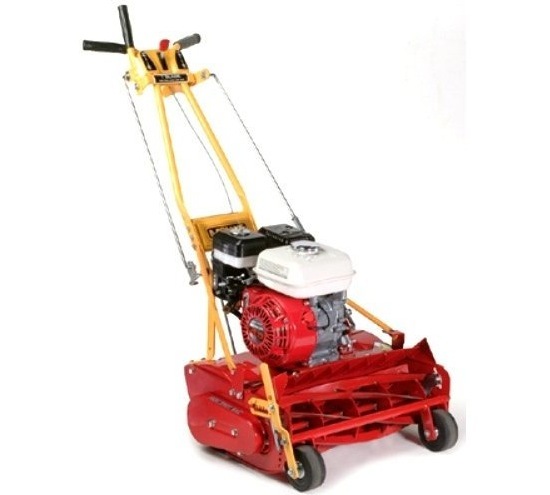 If you would like to avoid the hassles of a gasoline engine, and electric reel mower is a good option. Electric reel lawn mowers are battery powered. Somehow, the idea of using an extension cord trailing behind your self propelled reel mower as you zig-zag across the lawn leaves a little something to be desired. Those spinning blades on the reel could wreak instant havoc on the extension cord - the sparks would fly, and the mower would come to an instant halt. To prevent this calamity from occurring, the rechargeable battery provides the electrical power used to turn the electric motor. A disadvantage of this system relates to battery life. If your yard is large, the battery could be drained before the job is finished. Push reel type lawn mowers are for the purist. If you want that well manicured lawn, and are looking for a reliable source of aerobic exercise, a push reel mower may be right for you. 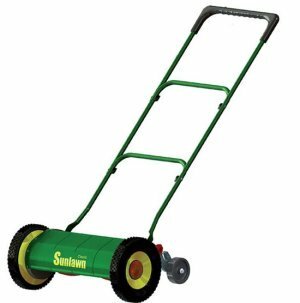 This type of machine is also suitable for very small yards where a motorized mower would be over kill. After a log hiatus, the push reel mower has started to make a comeback. Homeowners are again discovering the simple pleasures of mowing the grass without the need to wear ear protection or breathing in noxious exhaust fumes. Big box stores have even taking to selling push reel mowers recently, due to increased demand. 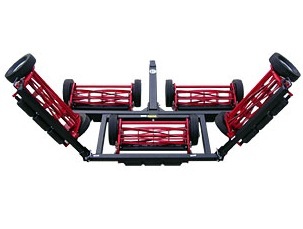 Take me to the Reel Push Mowers review page to learn more about these machines. 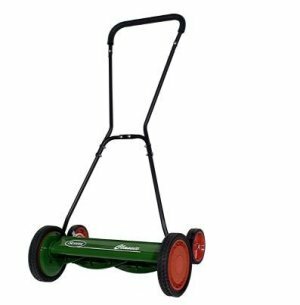 The Reel Gang Mower is a fantastic idea - cutting large lawns is a snap since several reels are combined together on a flexible frame. All of the advantages of the cutting action of a reel mower is provided, along with the speed of a ZTR rotary mower could provide. Maybe the biggest advantage of the reel gang mower is the fact that anything can pull this mower, from a golf cart, ATV, or a lawn tractor. Talk about versatility! It also has the capability to turn on a dime ( zero turn radius), and all models can be pushed backwards, when needed. Take me to the Reel Gang Mower review page so I can learn more about these sweet machines!